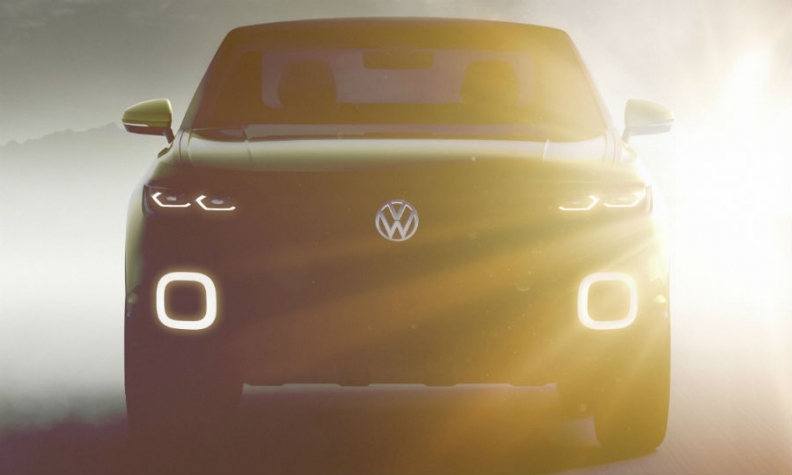 VW's teaser image shows an SUV concept with sleek headlights and distinctive fog lights. FRANKFURT -- Volkswagen brand is firming up its plans to join Europe's fast-growing subcompact SUV segment. VW Group's core marque will unveil a near-production concept for a rival to cars such as the Opel/Vauxhall Mokka and Renault Captur at the Geneva auto show next week. VW will also debut another concept in Geneva of a model for China, according to a company source, who declined to say what type of car it would be. VW released teaser images of the SUV concept to the media. The concept "can be seen as the beginning of a broad SUV offensive," VW said in a statement, which also said that the brand will unveil an updated version of its Up minicar at the show. VW said the concept will preview a "trendy, affordable SUV" but did not offer any more information ahead of the car's unveiling in Geneva. The concept will be positioned below the larger Tiguan compact SUV and seek to poach customers away from subcompact SUVs such as the Mokka, which will be shown with an extensive face-lift in Geneva. "Two vehicles new to the Volkswagen brand will celebrate their global debut in Geneva. One of them will be the [SUV] concept car," a VW spokeswoman said. Both are "close to series production models," she said. VW brand CEO Herbert Diess wants to have two SUVs positioned below and above the Tiguan, a company source told Automotive News Europe. The SUVs positioned above the Tiguan will be the current Touareg and an upcoming midsize SUV that will go into production at the automaker's U.S. plant in Chattanooga, Tennessee, at the end of this year. The Geneva concept "will give a taste of the design of one of those smaller crossovers,” the source said. VW showed the T-Roc study for an SUV positioned below the Tiguan at the 2014 Geneva auto show. The three-door T-ROC may form the basis for another SUV that would be larger than the Geneva concept but smaller than the Tiguan, reports said. The second-generation Tiguan, which is being rolled out across Europe, is larger than the current model, leaving room for two SUVs below it, former VW powertrain boss Heinz-Jakob Neusser told journalists at the Frankfurt show in September. VW's smaller Taigun concept unveiled at the 2012 Sao Paulo auto show in Brazil seemed destined to be built as a rugged small crossover for emerging markets. VW has confirmed that it scrapped plans to produce the car to focus on a model that could also be sold in Europe, now that the segment is booming. Sales of subcompact SUVs and crossovers increased by 36 percent to 1.04 million in Europe last year, according to data from JATO Dynamics. The Captur led the segment with a volume of 194,440, up 17 percent year-on-year. The Mokka was No. 2 with sales of 163,300, up 28 percent. A production version of the subcompact SUV concept to be shown in Geneva is unlikely to be sold in the U.S., where VW is counting on its new Chattanooga-built midsize crossover and long-wheelbase version of the Tiguan to boost sales. VW isn't commenting on the second world debut, but the source said it will preview a car destined for sale in China. VW is unveiling the concept in Geneva rather than at a China auto show because the brand wants to demonstrate that the car is "attractive enough to be successful in other markets" even though it is designed for Chinese buyers, the source said. The concept does not preview a budget car that VW has been developing for China, the source said.